Thinking about a campervan or motorhome holiday for the first time? Campervan expert Ewan Mearns shares his tips and hints for hiring a campervan in the UK and beyond. Renting a campervan or motorhome is an increasingly popular way to see the world. Whether you’re thinking about a weekend at Glastonbury, a coast-to-coast road trip or a fortnight’s family holiday, campervan hire is an ideal option. In the first part of our guide, we look at choosing the right vehicle, getting familiar with the facilities, and the costs of hiring a van or motorhome. Mention campervans and many people instantly think of the iconic vintage VW. These can be a great, cost-effective option, as well as looking cool! But after doing a bit of research, you may find that a modern equivalent ticks the right boxes for you. Less romantic of course, but a well-equipped VW California or luxurious motorhome may just give you the comfort and space for that all-important, relaxing experience. The trick is to think about what you want from your holiday and your campervan or motorhome, and select accordingly. Splitscreen or bay-windowed VWs are certainly the classic option and provided your hire company has maintained it well – and you’re in no rush to get from A to B – there are many possibilities. Vintage campers are generally most suitable for up to two people, and although some vintage vans may ‘officially’ accommodate up to four people, the reality is that more than a couple is a squeeze, especially when you factor in storage for the extra luggage. Pop-top options increase the sleeping space, but if there are four of you going, consider taking a small tent to pitch next to the van as an extra bedroom. Our holiday to the island of Islay was the perfect destination for our hired mid-70s Bay: we camped out among the dunes besides miles of beach and explored at a laid-back top speed of 55 mph. Be warned though, a crunchy gearbox, non-adjustable seats and a pop-top roof with a decidedly musty aroma soon dulled the shine of our romantic road trip. The lesson? Read reviews of your hire company first to ensure the vehicles are well maintained. Verdict: Best for couples, and shorter distances. More recent campervans based on the VW Transporter, Mazda Bongo and Toyota Previa may offer a more reliable and practical option. They generally drive like a large car (which makes them a better option than a motorhome if your itinerary includes exploring towns and villages) with a ‘high up’ driving position, and their modern diesel engines are quieter and more fuel efficient than vintage options. Choose a VW California or similar Transporter conversion to sleep up to four adults; Bongos, Previas and other campers are slightly smaller so will sleep two with up to two younger children. This size of camper offers a good compromise between practicality and style and more recent iterations are ingeniously configured to maximise every inch of possible storage and get the most out of the available space. You may hear people talk about ‘conversions’ and ‘factory’ models. In general, conversions refer to vehicles that started life as panel vans before being converted into fully-equipped campervans, usually by specialist companies. Factory models are built as campervans by the manufacturer, which can mean a higher spec and better storage configuration, a good example of which is the current VW California. You can read our review of the VW California here. Verdict: Best for families, and trips with town driving. Moving up in size again, motorhomes are a very popular hire option in the UK. While they won’t win any prizes for style, they win hands-down on space, practicality and comfort. They’ll sleep up to six in a range of fixed and fold-down bed configurations, and normally come with mod-cons such as a toilet, shower and TV. All this space comes at a cost, however. You’ll certainly be conscious of driving a larger vehicle and navigating smaller roads and car parks may concern those of a nervous disposition. But if your trip is more long-distance motorway driving and wide open countryside, the motorhome option is a good one. Incidentally, if you passed your driving test before 1997 and are aged under 70 then the C1 category on your driving licence will allow you to drive any motorhome up to 7500kg. Those who passed after 1997, or who are over 70 and haven’t renewed their C1 category, will be limited to vans weighing less than 3500kg. Verdict: Best for large families, and long-distance driving. Whichever option is right for your circumstances, it’s worth understanding the kinds of facilities to expect in a hired campervan or motorhome. The basic cooking facilities include a fridge, two-burner gas hob, water tank, sink and tap. Some may also have a grill or oven. This might not seem much but it’s a considerable step up from cooking under canvas and you can be surprisingly resourceful cooking on two rings! Foldable beds (that are stowed away for driving or living) are the standard option but you may also find fixed bunk beds and even double beds in a motorhome. Pop-top roofs – some that lift at the touch of a button – are great fun for little ones and an exciting ‘upstairs’ play space in inclement weather. If you’re used to camping under canvas and leaving your beds out all day, it’s worth remembering that because your campervan is both your bedroom and your vehicle, your beds will need putting away every morning and making again every night. So the need to be organised may put paid to notions of lazy lie-ins! In terms of washing facilities, it’s usually only the larger motorhomes that will have fixed toilets and showers although many hire companies will include a portable toilet (a porta potti) with a hired camper van. Remember, though, most sites have wash blocks, so unless you’re not planning to stay at campsites, this is unlikely to be deal-breaker. Campervans can be the most inventive and ingenious vehicles. Their multi-functional design means that fold-out tables, swivelling front seats, ingenious storage solutions and internal lighting are de rigeur. Also common are wind-out awnings (attached to the side of the van) and porta pottis (or even fixed toilets and showers in larger motorhomes). I never get tired, for instance, of demonstrating the way the two picnic chairs in my VW California are stored in the tailgate, with the outdoor table neatly stowed in the sliding door. So try not to feel too smug when you roll up on a campsite and have a cup of tea served al fresco within minutes – by which time your neighbours will just about have located their tent pegs! When you pick up a hired campervan or motorhome you should only need to take your clothes, food (best bought en route and unpacked straight into the storage cupboards) and other personal effects such as games, sports equipment and camera. Rental companies should provide the basics including bedding, cooking equipment (cutlery, utensils, crockery) and an outdoor table and chairs. Some may even include extras (some of which may be chargeable) such as DVD players, bike racks, roof racks and driveaway awnings. Pets can normally be accommodated at an additional charge. While you’ll be well equipped, just make sure you know how to use it all. Least familiar will probably be the ‘utilities’ – electricity, gas, water and toilet/disposal. This needn’t be a faff but ask your hire company for written instructions and a demonstration on pick-up. Most motorhomes and camper vans (even upgraded vintage ones) can be plugged into a campsite’s electric hook-up, powering 240v plug sockets, internal lights, fridges and ovens/grills. Hobs (and sometimes fridges) run off gas so you need to know how to switch the gas on and off. On-board water tanks can be easily refilled at a campsite and portable toilet waste should be emptied safely at campsite disposal stations. - are there mileage limits, and what happens if you exceed those limits? - are there any additional costs for insurance and extra drivers? - what are the arrangements for breakdown cover? (This should be included by most reputable firms). - is there a minimum age limit for the driver? When budgeting for your holiday, you’ll also need to allow for overnight campsite fees and fuel costs (larger motorhomes may only manage an eye-watering 12-18 mpg, for example). Choose the right vehicle to suit your trip: make sure it has sufficient space and storage for your party and is suitable for the distances you’ll be travelling. Pick a reputable campervan rental firm, and grill them on the small print. Make sure the hire company gives you a full briefing on every aspect of the campervan or motorhome. Enjoy! Even the mishaps will become stories to recount and laugh about in years to come. In conclusion, hiring a campervan or motorhome gives flexibility to travel and is a great option for singles, couples, groups or families. As long as you keep a healthy balance between driving and camping it will suit kids of all ages, and providing your vehicle has heating for the living area there’s no reason why you can’t take off at any time of the year. It’s also a great way to thoroughly ‘road test’ the idea of buying a campervan at some point! Read part 2 of this guide for my tips on taking your hired campervan ‘On the Road’, or, if you've been inspired and just want to go now, you can browse a wide range of campervan hire companies too. see you out there! 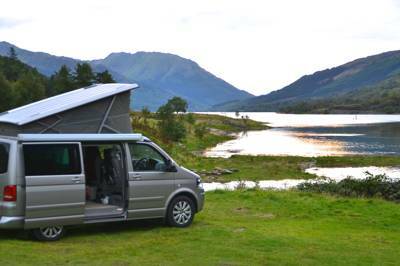 Ewan Mearns is an experienced camper, backpacker and campervan owner with a passion for exploring the outdoors. You can find many more insights and tips at his award-winning blog, WildaboutScotland.com.